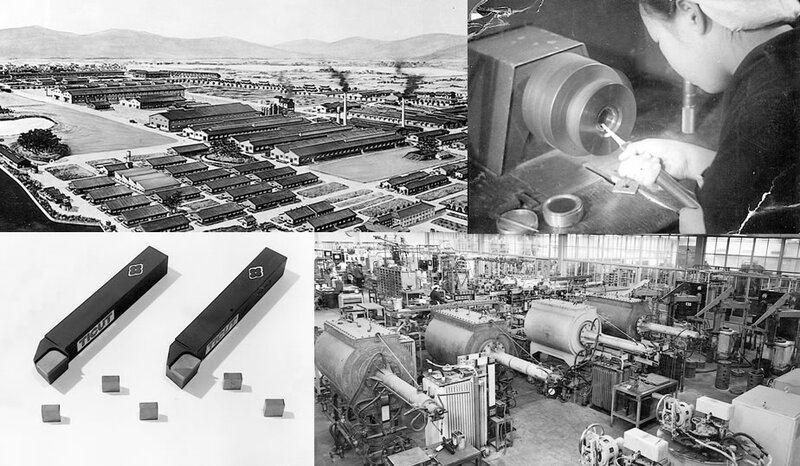 Brand History » Sumitomo Electric Carbide, Inc.Sumitomo Electric Carbide, Inc. The world’s first cemented carbide was born in Germany in 1923, and was marketed under the name “Widia” by Krupp in 1927. In the same year, Sumitomo Electric started research on cemented carbides and by the following year, we were successful in making a prototype of cemented carbide wire and cable drawing dies. Cemented carbide cutting tools were commercialized in 1931 and that was when “IGETALLOY” was born. Before and during the war, our unique production processes centered around the military. After the war, we were engaged in finding market opportunities, fundamental researches and application developments for the regeneration of IGETALLOY. New factories were built and introduction of overseas technologies were promoted, which expanded the production and advanced the development of new materials and products. This is how the foundation of “IGETALLOY” was formed. In 1956, the Economic Survey of Japan declared “We are no longer in postwar…”. “IGETALLOY News” was first published in June that year. We also started to launch the institutionalization of “IGETALLOY Association” and the arrangement of selling organization, including the foundation of “National Distributors’ Meeting”, reinforcing our foundations for sales and advertising activities. This is the period when new tooling materials such as ceramic, cermet, etc. and new products such as throw-away tips (indexable inserts), chipbreakers, and cutters emerged (late 1950s), which drove the development of IGETALLOY since the 1960s. The Hardmetal Division, which is the Sumitomo Electric’s first division was born right at this time. 1960s saw the era of space exploration race between the U.S and Russia, starting from “The Earth is Blue” (by Major Gagarin in 1961) up to the lunar landing by Apollo 11 (in 1969). On the other hand, there were a lot of domestic news taken place in succession which attracted the world’s attention; including the opening of Shinkansen (bullet train), Tokyo Olympic Games and Anpo Toso (Japanese national campaign against the Security Treaty). Innovation in cutting tools saw the introduction of throw-away insert tools in the 1960s, which brought a significant change to cemented carbide tools. Ahead of the industry, we have made a lot of efforts in developing and releasing SEC- (*) tools and have contributed to the revolution of machining as a “pioneer of throw-away insert tools”. During this period, mass-production facilities including Kyushu, Hokkaido, etc. were set up to reinforce the development of IGETALLOY.